During Lent we are surrounded by visual reminders of Jesus' last hours. In Stations of the Cross, renowned author and spiritual master Timothy Radcliffe, OP, offers readers a thoughtful meditation on this powerful devotion. 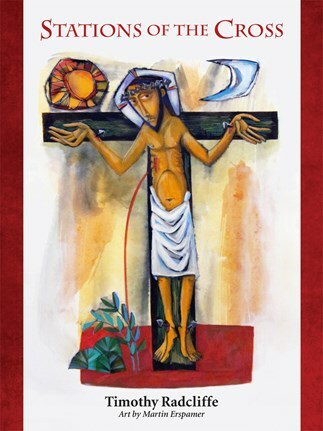 Through word and image Radcliffe offers a profound experience of reflecting on the Stations of the Cross that is both visually and spiritually inspiring. With each reflection, he draws from stunning art commissioned by award-winning liturgical artist Martin Erspamer, OSB. Stations of the Cross is perfect Lenten reading by an author well-regarded for his spiritual writings. It is a beautiful invitation to deeper meditation and richer contemplation of this solemn season of prayer and penance. Timothy Radcliffe, OP, is a member of the community at Blackfriars, Oxford, and was Master of the Order of Preachers from 1992 to 2001. He is the only member of the English Province of the Dominicans to have held the office since the Order's foundation in 1216.He is the author of a number of very popular books drawn from his experiences and a contributor to Give Us This Day published by Liturgical Press. Martin Erspamer, OSB, is a monk of Saint Meinrad Archabbey in southern Indiana. He is a well-known liturgical artist and liturgical consultant. Erspamer works in a wide range of media, including pottery, stained glass, and wood, and is nationally known for his illustration of sacred themes. This book offers a meaningful alternative to the traditional stations and is a worthwhile book to read every Lent. Radcliffe seamlessly weaves the stops that Jesus made on the way to Calvary with spiritual reflections drawn from Scripture as well as his own experiences and references to poetry, film, literature, and art. The book provides a wonderful Lenten reflection that can be used in schools, parishes, and homes for the elderly, as well as for personal reflection throughout the year. Anywhere in the world, from Chicago to Tokyo, you can walk with Jesus, see him embrace his mother and meet the daughters of Jerusalem, be crucified and buried. This is a beautiful expression of the core of our faith, which is that Jesus embraced the dramas of every human life, our triumphs and failures, our joys and sorrows. In the Stations of the Cross, we remember how the Lord is with us, especially when we seem to be stuck and have lost the way forward. He walks with us, and trips with us when we stumble and helps us to our feet again. A Benedictine artist, Martin Erspamer, and a Dominican theologian, Timothy Radcliffe, team up to produce this beautiful rendering of the Stations of the Cross. Erspamer portrays each station in vivid color and engaging form, while Radcliffe's meditations link the biblical context of each station with everyday Christian experience. Here is an apt Lenten gift!